You can’t tell from the illustration, but the hippo is singing a song about metamorphosis in English, French, and Portuguese. today for show and telling. in reading, math and science. we listened there in silence. I sat in back and fussedamus. would be the one and only. Wouldn’t it, though? 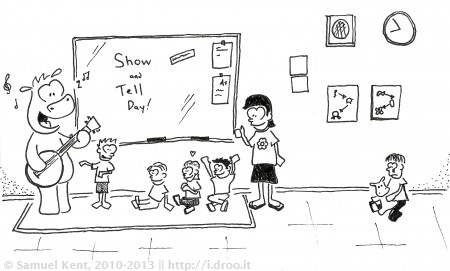 I was always afraid that this would happen to me at show and tell. This one is so much fun, and would probably tangle a tongue or two if read aloud! Cool! I’m glad you enjoyed it.